Customized carabineer with compass – black is that multipurpose token, which never misses the attention. It can easily aid a user to check the direction and also manage their keys. It can be clipped to backpacks or bags or purses or belt loops with ease. It suits travel, sports and adventure marketers, and many more that are targeting outdoorsy customers. This carabineer with compass – black can be considered for individual gifting or bulk gifting depending on the choice. We offer attractive price savings on bulk orders of this compass. 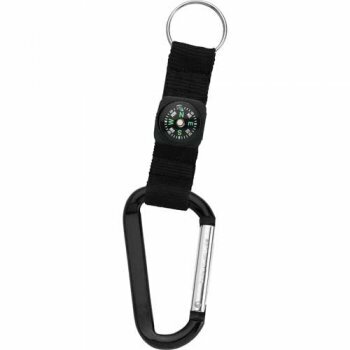 Request a quote to know discounts offered on wholesale orders of this custom carabineer with compass -black. 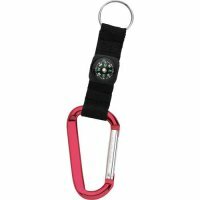 Features –Woven nylon strap with compass. 8mm carabineer. Metal split key ring. Laser engraving recommended. Not intended for climbing.